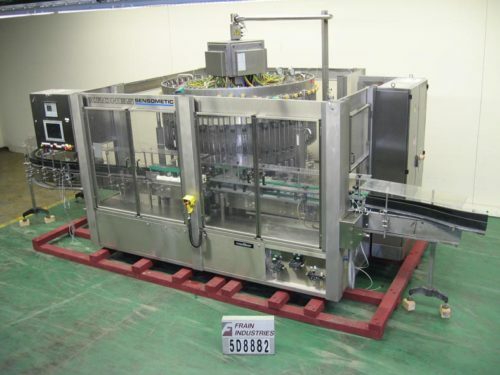 Automatic, stainless steel, 48 head, gravity filler capable of filling 100 to 500 containers per minute – depending on materials and application. Containers: up to 5" in Diameter; up to 12" in Height. Equipped with 3-1/4" wide conveyor, worm screw to star wheel in feed, star wheel discharge, 4" diameter container pedestal, 5 1/2" pitch, neck centering bottle guides, 5/8" O.D. nozzles, bottom-up fill with long tube filling valve (designed to minimizes foaming), three 2" tri-clover in / out product connection, E-stop, touch screen interface, Allen Bradley 5/20 PLC, Allen Bradley SLC 5/04 CPU, temperature gauge & pressure gauge for product hold tank and CIP catch channel and drains around filler table. Mounted on stainless steel frame with height adjustable feet.